One of the hardest things when trying to get into the property market is actually taking that time and saving that deposit. When I asked the question to my email subscribers what is the number one difficulty you have holding you back from investing, saving your house deposit comes up as either the top or definitely within the top 2. 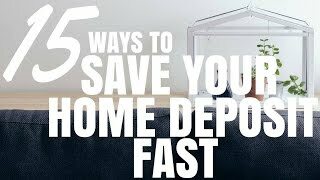 So saving a deposit is something that a lot of people have difficulty with so today I want to show you 15 different ways that you can save your house deposit faster, you can save it quickly and just some things that you may not have thought of. Let’s get into different ways that you can save your home deposit quickly. For more tips click here. Well hold on! You don’t need to buy a dream home as your first home. By lowering your require deposit you can get into the property market quicker and you can make saving a deposit that much easier. There are many different ways that you can lower your deposit requirement. The two major ways that people do this is firstly, go from trying to save a 20% deposit and look at saving up 5 or 10% deposit. Lenders are allowing people to borrow and to buy property with just a 5% deposit and you got to have to pay lenders mortgage insurance which is an extra insurance that you pay because you don’t have a 20% deposit. But hey if that means they can get in the market this year instead in 20 years time when you save that massive sum of money, well then maybe it’s worth it for you. You can also get in with a 10% deposit or with somewhere between 10-20%. So I do recommend you go and speak to a mortgage broker, they can let you know the different loans that are out there. So the first way is to lower the percentage of the deposit you want to save, from a 20% to a 10% or 5% but you can also look at cheaper properties. Maybe you don’t want to buy your dream home first of, maybe you want to buy an investment property or maybe you want to buy a cheaper home in the area that you love or cheaper home a bit outside the area that you love. 20% of a $1,000,000 is $200,000, 20% of a $200,000 is only $50,000. So there’s a big difference in $50,000 to $200,000 when you are trying to save your deposit. 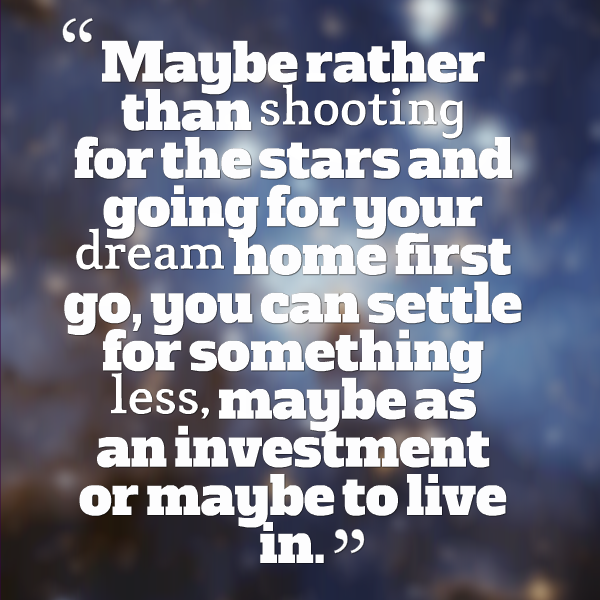 Maybe rather than shooting for the stars and going for your dream home first go, you can settle for something less, maybe as an investment or maybe to live in. 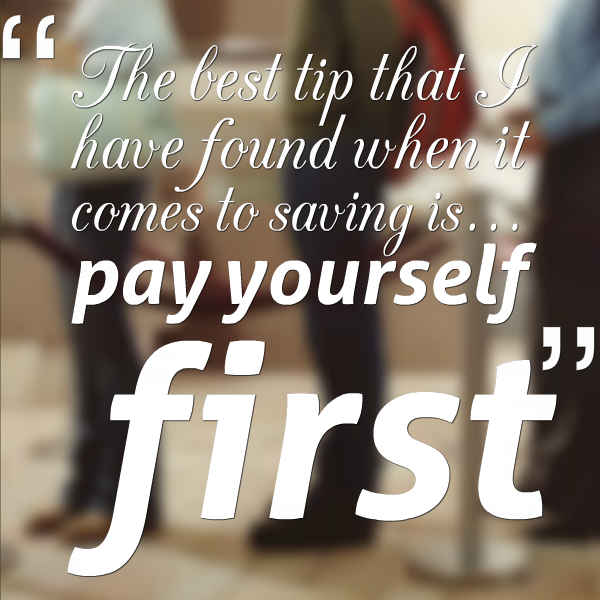 Tip number two is the best tip that I have found when it comes to saving and that is pay yourself first. Rather than getting your income, getting your wage, whatever it might be, a living the month and then saving whatever is left over; why don’t pay yourself first? This means, just like tax is taking out your pay before you even get it, you should take your savings out of your pay before you give it to yourself. So that means as soon as it comes in, on a day that comes in you move it out into a savings account, preferably one that you cannot touch. That means when the money comes in, move it away straightaway on the day that you get it, preferably into account where you can’t touch it. You can set up accounts with many banks where you have to go into the bank and you have to sign up forms to actually take money out of it or if the first home owner buyers account (I can’t remember exactly what it’s called) if they’re still available then you put money in them and you actually can’t get that money out unless you’re going to buy a property or you’re in really dire circumstances. So by paying yourself first and then learning to live off the rest or learning to make more money so you can afford to live with what you’ve got is a great step to force yourself to save and to actually make sure it happens. Because we all know that when we get to the end of the month no matter how much we earn, there’s no money left. So by deciding at the start of the month that you’re going to save money well then you’re more likely to do it and it’s more likely to happen then, if you just hope for the best and hope that you scrub and save enough to save your deposit. Tip number three is to earn extra income. Maybe on the side, maybe you want to start a side business which is what I did. I used work as a pharmaceutical rep before I moved into my own business full-time and on the side I did blogging, I did videos, I did podcasting, I created the information products and made money through advertising. I dabbled on the side in my spare time and did this and it earned me a decent extra income. We’re talking about anywhere from $500 to $2000 dollars in passive income per month from this side business that I had going. Granted, I had been doing it 7 or 8 years by the time it was at that sort of passive income but doing some work on the side maybe it’s a part time job, maybe you are mowing lawns in your local area of maybe doing internet business like I did. But by doing something on the side and earning an extra income and just it is in that income to pay or save extra on your deposit, or if you already paid yourself first then just use that income to then improve your lifestyle. Because you already know that you’re going to save your deposit in the time frame that you want. So that’s tip number three- look for some sort of side income, some sort of the extra income. Tip number four is for those of us who don’t want to do that or who don’t have enough time to do that. Try and find a way to get a pay rise. Now there’s more qualified career experts out there that can talk to you about exactly how to approach your boss to get a pay rise. In my own life I found the best way to get a pay rise was actually to move companies. There was a job that I was at and I was earning not a great wage but I was a good employee and I had found a new job which was going to pay me I think it was $15, 000 or more plus commissions. So I went to my employer and I was open with him, and I said “look I’ve got this job on the table, it hasn’t come through yet but this is what we’re looking at” and he immediately offered me almost $30,000 more for me to stay. Now I didn’t end up staying because there was commissions and stuff like that in the other job that means I was going to earn the same amount of money and there was more chance to move up in the chain which is exactly what happened. But by actually going somewhere else I was able to increase my wage. I don’t suggest going ahead and using another job as leverage to get more money for the current job you’re in because you will end up despising them anyway. But by moving into another company and by stepping up you may find that you’re able to get a pay rise for doing the same work or for doing similar work because you’re able to move to another company. Otherwise you’re just going to be stuck with that 3% pay rise every single year just to keep up with inflation. So look for ways to get pay rises, that’s as much as I can say, I’m not super experience in this. Tip number five is tricky one, not one that a lot of people are willing to do but if you are willing to do it then it is going to help you and that is to sell or downgrade a car. Maybe you have one nice car as a family, or maybe you have two cars. Can you survive on just one car? (we do) If you can sell a car or if you can sell an expensive car and purchase a less expensive car and get by with that less expensive bomby car for a while, well then that chunk of change that you get from selling a more expensive car to downgrade, you can put that straight towards your deposit. Or if you have two cars and you sell one, you can put that straight towards your deposit. It’s a great idea, it’s a sacrifice not a lot of people are willing to make, but I have heard stories of super experienced, super wealthy investors who were driving around in bomb cars for their first years as investors because they wanted all the money they could get to invest in property because they knew they were doing it for the future. Now they’re super wealthy, they drive awesome cars. So can you sacrifice a car for a certain period of time? If you can it’s definitely something to consider. Tip number six is to rent out a room or a garage so maybe if you’re renting or maybe you own it and trying to buy an investment property, can you rent out a portion of your property? Maybe you’ve got a spare room that you can rent out to one of your friends or to someone else, maybe you’ve got a garage that you could rent out or a storage space or for someone who doesn’t have a garage in the area. Are there ways that you can use the property you’re currently living in and rent out a portion of it so that you’re not paying as much rent? Now obviously if you’re on a lease you do need to consider the lease in the terms of that and in some cases subleasing or having someone live in the property who is not in the lease is not available so to speak to your real estate manager or your landlord about that to make sure that everything is above board and you’re not doing anything to dodgy. But that’s definitely something to look at, a little bit of an out of the box idea but hey, if you can get $50 or a $100 a week for a room that’s $5,000 a year that can go towards your deposit. Tip number seven is to look at family trust guarantor loans. Now I did a video podcast with Brad who’s from OceanHomeloans.com.au and with Brad I talked about these family guarantor loans or family trust loans or family pledge loans, they got a few different names. And we talked about exactly what they are, we talked about how they worked and we also talked about your worst case scenario if things do fall over. But a family pledge guarantor loan will allow you to get into property with no deposit or will allow you to avoid paying lenders mortgage insurance if you don’t have that full of 20% deposit. So maybe you’ve got a 5% deposit but you don’t want to pay lenders mortgage insurance or maybe your parents are willing to put up some security so that you don’t have to pay that and you can do that. So family pledged guarantor loans – check out the video with Brad that I did, that one I definitely recommend if you’re interested in that at all. Tip number eight is to look into government incentives. So a lot of the state’s have incentives for the first-time buyers or for a new build properties because obviously we got this situation in Australia where affordable housing isn’t something that’s really available and house prices to rent or to own are getting out of control. Check out the government incentives in more details here. And so the government wants to incentivize people to build new properties and sometimes they will do extensions from stamp duty or sometimes they will give you a seed fund or a grant of certain amount of money to go towards your property purchase. Rather than having to save the full deposit maybe you don’t have to pay stamp duty and maybe get a kick up from the government as well which means you need to save a small deposit. So look into your state, look into what’s available in your state right now. I’m not going to say everything that’s out there because the truth is they change every so often so just give it a google, check it out, and work out what’s available in a different states because you don’t necessarily need to invest in your state. Maybe the new build grant isn’t available in your state but it is available in another state, maybe you can look into building in another state. Tip number nine is to sell your stuff. So this is getting on a eBay or GumTree or having a garage sale and getting rid of that junk that you don’t use anymore. Maybe you’ve got old iPhones or old mobile phones or old laptops, you’ve got old couch or whatever it might be. There’s so much stuff you have lying around your house that is valuable and that has.. that could be converted into cash that you could use to save your deposit faster. So do a big spring clean, put some stuff up on eBay, I know it’s painful to sell it by hey if you can get that money it means you can get in your own property faster well then, wouldn’t that be worth it? Tip number ten is to shop at Aldi, Cosco, these other discount stores. I’m a big Aldi shopper, I actually really love Aldi, you get so much and the quality is actually really good. And so the way me and my wife work it is that we will shop at Aldi for the majority of our items and stuff that we can’t get at Aldi, stuff that is not high enough quality at Aldi will get from somewhere else. So by choosing to buy the bulk of our food at a discount store we save a huge amount of money and then we only need to go to Coles, for the rest of the stuff that we can’t get at Aldi, things like all-woman things like dry shampoo in different types conditioner, spray tan, so much beauty stuff. But my wife looks beautiful so it’s totally worth it, I totally am willing to pay for that but we can’t get it at Aldi so we can’t get it for cheap and so we got to go at Coles for that. Look at shopping at these discount stores. It’s not like it used to be, like at IGA how they have all “black and gold” it’s just super dodgy. It’s actually really high quality stuff now but it’s just super cheap. Tip number eleven is to lower you rent. My parents did this when they purchased their first property, they moved from a house on the water on Esplanade in Cronulla which is a beachside suburb in Sydney. They were right on the water and they moved from there to a dodgy house in a suburb called Rockdale which is further back from the beach. They hated the house, whenever they talked about the Rockdale house they talked about it with dread. But they dropped their rental amount so that they could save to buy a house and then they bought a house in Woolooware which is just one suburb back from the beach and so that’s the house that I grew up in. They chose to discount their rent and live in a property that wasn’t as good so they could afford to put more money towards their mortgage and then they bought a house for $120,000 and sold it for $825,000 20 years later. So, good decision at the end of the day. Tip number twelve is to create a financial plan. And this is something that a lot of people when they want to buy a house don’t actually create a financial plan of how they are going to get there. So this is sitting down by yourself or sitting down with your spouse and going through your finances, working out how much you can afford to save, working out what you want to buy, how much of a deposit you need in a time frame you want to get there in. And basically you’re setting out a plan so you know for the next 12 months, 18 months, 24 months you’re going to be saving a certain amount of money each and every month to get towards your goals. So by creating a financial plan at the outset, writing it down on paper, setting those goals, you’re much more likely to actually go ahead and achieve it. You actually set a financial plan and you’re like “Yeah, I’ll just save a deposit, one day.” Then is it going to happen? Probably not. So set up a financial plan, write it down on paper, put it on the fridge where you can see it every single day and track it. Tip number thirteen is to conceder of buying a property with your super. Now, I’m not a financial advisor so I can’t give any super advice and I can’t say that you should buy property with your super or whatever. And the fact of the matter is I don’t think that you can actually live in a property that you buy with your super. So if you want to go ahead and purchase you own home then this is definitely not going to work for you. But if you want to purchase an investment property and you need access to deposit cash flow that generates straight away and you just want it to build up your retirement funds that when you hit 65 you can be whooping rich, well then consider investing with your super fund. At the moment I’ve got a free eBook that I’m giving out to anyone who’s interested in investing in property through their super. Tip number fourteen is to enlist the help of an advisor. This maybe someone like a mortgage broker and maybe a financial advisor or maybe a company that specializes in investment properties. They may be able to show you how you can save your deposit quicker or how you can get into the market quicker with less of the deposit. And tip number 15 is to make alternate investments in the meantime. So rather than just stuffing your money in a sock in your draw and leaving it there why not look at different ways that you can invest to grow your income in the mean time? You might want to invest in something like the stock market, you might want to invest in online businesses or web sites which tend to generate great rental yields, you might want to invest in something like an ATM machine which you can purchase and get a return on that. There’s many different alternative investments that you can make to help you grow your savings without actually putting any more money in savings and then as just savings grows obviously your return is going to be better because you got more money in there. And so therefore it compounds and actually grows quicker and quicker. 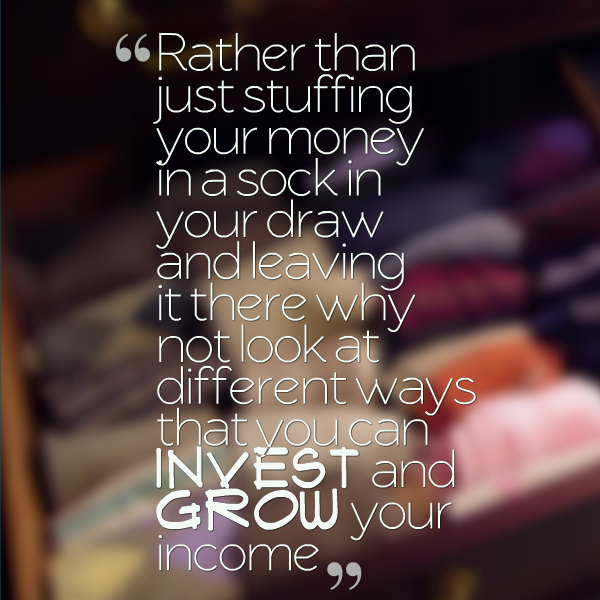 Rather than just stuffing your money in your sock draw why not consider investing and actually putting that money to work for you so that it grows all by itself at the same time while you are adding money to it? 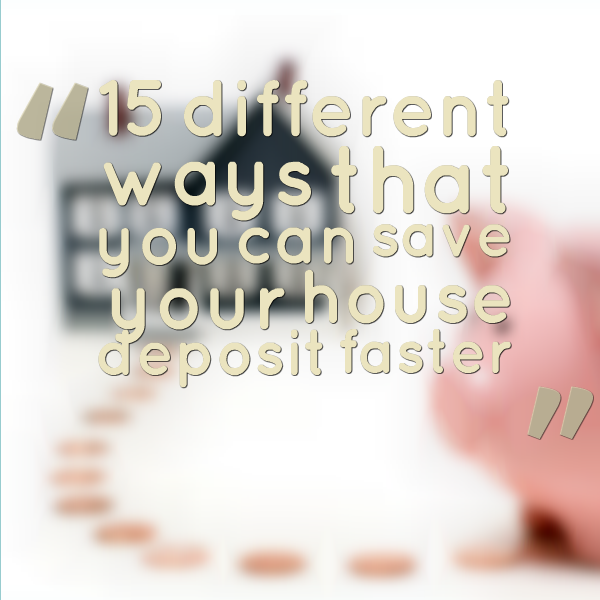 So there are 15 ways that you can save your home deposit quickly. This has been a much longer episode than usual so thank you everyone who had stuck with me, I hope that this has been extremely helpful and I got a feeling that this is going to be one of those articles that just gets viewed thousands and thousands of time over the course, over the years. So I hope that this has been helpful to you. Saving your deposit for THE RIGHT property is extremely important. Doing the cash flow analysis on a property will increase your chances of buying a winning property that moves you towards financial freedom. Make analysis property easy by signing up for PropertyTools.com.au and taking advantage of all our investor calculators and spreadsheets.